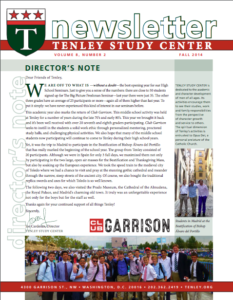 Here’s the latest edition of our popular newsletter. A lot has been happening at Tenley. We brought back our club for 7th and 8th grade boys, travelled to Spain for the beatification of Don Alvaro, and received record breaking applications for our seminar series. In addition, one of our students writes of his experience volunteering in one of our summer programs, the Peru Service Project.